My workday breakfast is a bowl of porridge with cinnamon and bananas, healthy; yes, exciting; no. Even though we try and be creative in the kitchen, we always go back to our kitchen favourites time and time again. The point is not to be so diverse that every meal requires discovery (as well as trying to shop for obscure ingredients) but to provide a variety. After all, variety is the spice of life. So if we go to great efforts to be creative at dinner times why do we not do so for breakfast and lunch? Simple. Lunch has become a meal on the go, fuel to keep us going into the afternoon. Today’s societal pressures demand that we spend more time working than enjoying a good mid-day meal. And breakfast, the most important meal of the day, has become a monotonous, monochrome affair in a bowl. I am just as much to blame as everyone else: “My tummy hasn’t woken up yet”, “Not hungry in the morning”, “Just don’t have the time” are the standard excuses and reasons we come up with for not having a more varied breakfast. Great weekend breakfasts, that even young children could put together, are American-style pancakes. Where I would normally slice strawberries on top, the quintessential American alternative of streaky bacon, blueberries and maple syrup (which I previously would steer away from) is just divine. The sweet maple syrup providing a counterpoint to the saltiness of the bacon. 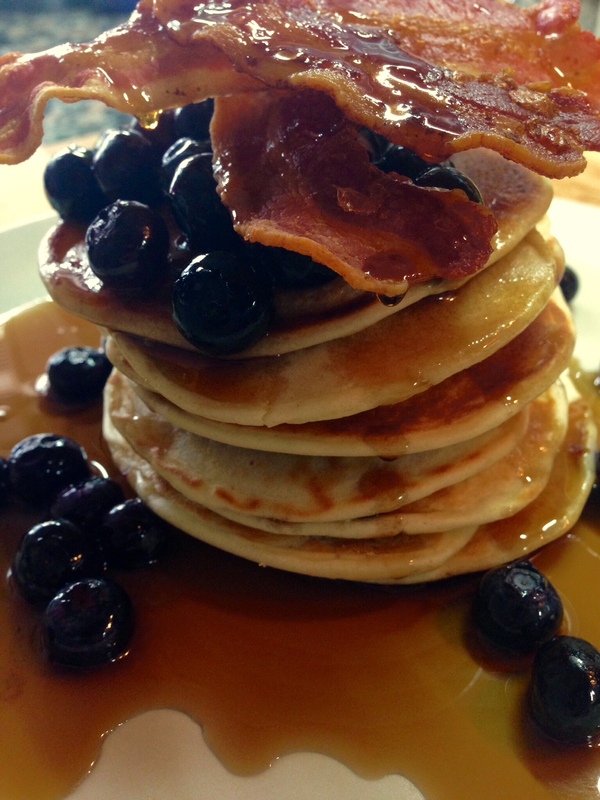 Texture-wise they also tick the right boxes – fluffy pancakes; crispy bacon. If, however, you need to convince yourself that you are eating healthily remember: the fruit is healthy and is one of your five-a-day and blueberries are an antioxidant so therefore a clear winner! These can be made every weekend but with the Easter weekend fast approaching these would make a great bank-holiday breakfast. They don’t need that much more time to prepare than porridge but are infinitesimally more fun, exciting and tasty! 1st: Melt the butter and allow to cool. 2nd: Mix the flour, baking powder, salt and sugar in a bowl. 3rd: Add the milk and whisk. Crack an egg into the mixture and add the cooled butter. Whisk again. Set aside for a few minutes or overnight. 4th: Heat a skillet and add a knob of butter. Once the butter has melted add ladlefuls of the batter to the skillet. Top Tip: Prepare the batter mixture the night before and keep it in the fridge, add a splosh of milk in the morning to slacken the mixture.